"I was in the area of Virginia/Maryland. I am not sure of the exact area, but I just knew that is the general area where I was. There were many people on the beach area and they seemed to be having a good time. Then I noticed that many of the people there were suddenly startled by something (maybe it was a loud explosion, not sure) as they all started to look into the sea very concerned. As I drew closer to look in the direction that everyone was looking at, I saw far away in the distance a strange movement in the waters. As I focused on it, I was gently taken up in the air above where this event was taking place, and I was able to see a huge whole in the sea. It was a very large and very deep hole. I could clearly see the brownish sand at the bottom of the ocean. I do not know what created this hole in the Atlantic Ocean, but I knew that it was not good as the waters began to swirl around ferociously (looked maybe like a whirlpool or some kind of vortex). It looked very threatening. I was then brought back to the shore away from the sea and placed back down on the ground gentlly. I felt completely safe and protected in the arms of the Lord the whole time as I was watching these events unfold. I felt at peace, not scared at all although I did feel the fear that was coming from the crowds of people that were there. 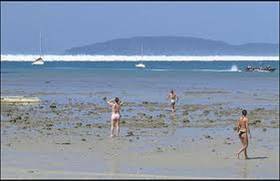 They started running all over the place realizing that a large Tsunami was soon coming upon them. I was taken to a place very high on a hill where I could still see the event. I saw the waves begin to come in more and more, covering the land like a monster. 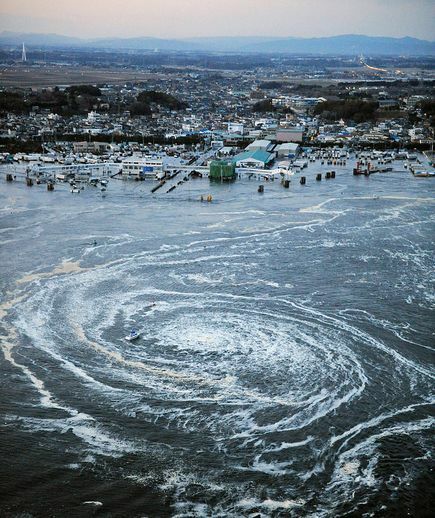 Then I realized that whatever the event was that had taken place, it had caused a big Tsunami. I noticed that the waters of the waves, as they were coming in, had a lot of foam associated with it. I remember thinking how strange that was. Then I came to my senses." Something will happen off the coast of Virginia/Maryland that will trigger a large Tsunami affecting the Eastern Seaboard. It could be an asteroid hitting the ocean in that area, an earthquake, an undersea volcano erupting or something else that caused it. I was not shown what it was that caused it, but whatever it was it created a giant hole in the ocean triggering a massive (Whirlpool) Tsunami that will directly impact the whole Eastern Seaboard, but mostly the States of Virginia and Maryland. I must warn that everyone who lives in this region should make spiritual preparations as well as physical preparations. The Lord Jesus Christ, Yahushua does not want anyone to perish, but that all come to salvation. Please, visit our salvation page and get right with the Lord. Time is running out and The Day of the Lord is upon us. Watch and pray that you may be accounted worthy to escape all these things that shall soon come upon the world, and to stand before the Son of man. Luke 21:34-36: "And take heed to yourselves, lest at any time your hearts be weighed down with carousing, and drunkenness, and cares of this life, and so that day come upon you unawares. For as a snare shall it come on all them that dwell on the face of the whole earth. Watch therefore, and pray always, that you may be accounted worthy to escape all these things that shall come to pass, and to stand before the Son of man." Ezekiel 33:2-5: "Son of man, speak to the children of your people, and say unto them, When I bring the sword upon a land, if the people of the land take a man from their territory, and set him for their watchman: If when he sees the sword come upon the land, he blows the trumpet, and warns the people; Then whosoever hears the sound of the trumpet, and takes not warning; if the sword comes, and takes him away, his blood shall be upon his own head. He heard the sound of the trumpet, and took not warning; his blood shall be upon him. But he that takes warning shall deliver his soul."